Home / Unlabelled / WHAT QUALIFIES YOU FOR JANNAH? 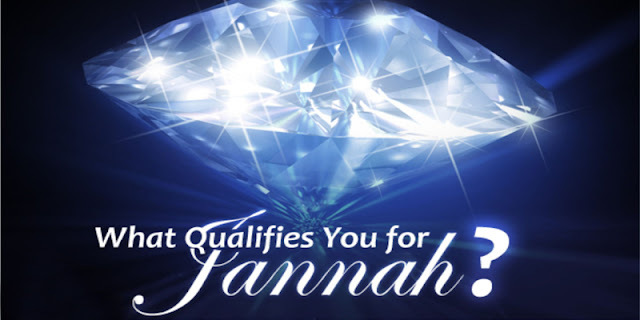 WHAT QUALIFIES YOU FOR JANNAH? The bounties that we receive are means by which Allah (swt) refines us and prepares us to enter Jannah. When we’re blessed with many bounties it’s common to think we’re better than others. We tend to feel superior if we’re blessed with family, friends, beauty, health, wealth, children, or knowledge etc. We often forget why we’ve been blessed with something that’s been denied to others. There is a wisdom behind each of Allah’s decree on us. It’s a natural human weakness to forget to value the bounties we’ve been granted. We want to think that good things have come to us because of our own goodness, and we forget that the more we’re blessed, the more we’re tested. Some of us go beyond this and assume that we’re even qualified to go to Jannah with what we have in this world. Some of us assume that being born to Muslim parents gives us a free ticket to Jannah. Still others among us think that having a proud lineage, connected to great personalities in history, automatically reserves our seats in Jannah. Allah will surely credit us for the way we used His bounty for others. If we’re rich Allah (swt) will judge us according to the way we treated the poor. If we’re blessed with children Allah (swt) will judge us according to how we raised them and according to how we treated those women unable to bear children. If we’re healthy Allah (swt) will question how obedient we were in following His instructions. If we’re blessed with intelligence and talent Allah will judge us by how we used these gifts in His service. Everything blessed in this life is a test for us on the Day of Judgment. A person who is physically challenged is not in this condition because of sins he or his parent have committed; rather this is a test for him and his parents. Whoever bears the pains patiently and accepts what life brings, believing, will be rewarded on the day he or she meets The Almighty Allah (swt). Allah says ‘’He Who created Death and Life, that He may try which of you is best in deed: and He is the Exalted in Might, Oft-Forgiving’’. [Quran, 67:2] The proud who oppress others will win today but not in front of Almighty Allah (swt). Nothing Allah (swt) gives you is due to your superiority; rather it is Allah’s mercy, and surely, He is testing you! Remember that the most tested on this earth were the ones who were sent with glad tidings from Allah (swt). Every prophet may Allah (swt)’s blessings be on them, was tested with difficult tasks on earth. Accept life as if it’s borrowed and you must return it! The worldly deeds we earn will never serve as qualifications to enter Jannah. And remember that being beautiful, healthy, wealthy, or blessed with children or knowledge won’t take us to Jannah unless we use these things according to how Allah (swt) wants us to use them in this world. There’s always a cost for the best, so there’s no free ride to Jannah. Let’s strive to use the blessings of Allah (swt) for the sake of Allah alone. May Allah help us work towards Jannah in a way pleased to Him, Aameen.